Prices of major food commodities declined for the fourth year in a row in 2015 according to the UN Food and Agriculture Organization (FAO), averaging 19.1 per cent below their previous-year's levels, while the agency also reported today that the dwindling global economy has triggered sharp price falls from metals to energy markets. FAO's Food Price Index, a trade-weighted index tracking international market prices for five key food commodity groups (major cereals, vegetable oils, dairy, meat and sugar) averaged 164.1 points over 2015 and ended the year even lower, at 154.1 points in December. During that month, the index reportedly declined a further 1.0 per cent from its revised November value, as falling prices for meat, dairy and cereals more than offset gains by sugar and vegetable oils. "Abundant supplies in the face of a timid world demand and an appreciating dollar are the main reason for the general weakness that dominated food prices in 2015," said FAO senior economist Abdolreza Abbassian in a press release. In more detail, the UN agency reported that its Cereal Price Index declined 1.3 per cent in December from its November value, due to intensifying export competition among maize producers and expectations of more wheat supplies entering world markets after Argentina removed export taxes. The sub-index, which includes rice, shed 15.4 per cent on average during 2015 from the previous year. Meanwhile, the Dairy Price Index subsided 1.0 per cent in December, and over the year was 28.5 per cent below its average level in 2014, the sharpest decline of any food commodity. Turning to the Meat Price Index, FAO is reporting a 2.2 per cent drop in December, prompted by surging pork output in Europe and reduced U.S. demand for imported beef. Over the full year, meat was on average 15.1 cheaper than in 2014. In regards to the Vegetable Oil Price Index, it rose 2.1 per cent in December, pushed up by uncertainties regarding Brazil's soybean crop, but over 2015 as a whole was 19 per cent below the previous year. 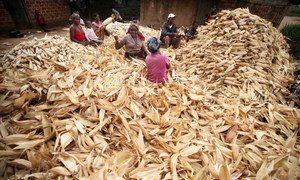 Finally, FAO's Sugar Price Index rose 0.6 per cent in December, but was on average 21 per cent lower in 2015 than the previous year.